I will feature your home on this custom Hayden Lake website as well as my personal website. My personal website is www.InmanWindermere.com. I have a detailed and unique Marketing Plan for my Luxury and Waterfront Listings! I had a professional photographer take stunning pictures of Hayden Lake and have those ready to go to add to your listing! Many buyer's come from out of state so I want them to be able to see online everything Hayden Lake has to offer! I already have professional photographs of Hayden Lake including aerial views of Hayden Lake, Honeysuckle Beach, Hayden Lake Country Club, Boathouse, Tobler’s Marina, Sand bar, Sunset pictures, Gold Coast, Wildlife etc. I will make sure buyer’s can see how much Hayden Lake has to offer! I will also create a custom website specifically for your home!I will hire a professional photographer to capture the Hayden Lake setting and amenities of your Home, Aerial Views and Virtual Tours! I personally own a 2nd home on Hayden Lake so I know first hand everything Hayden Lake has to offer! We can offer boat tours on Hayden Lake to potential buyer’s interested in looking at your home! I am very familiar with the Hayden Lake market and the active and sold homes on Hayden Lake. 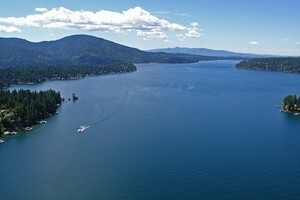 Hayden Lake is located North of CDA in the beautiful panhandle of Idaho. Hayden Lake has so much to offer with it’s sandy beaches, beautiful mountains and clear waters. Hayden Lake has over 40 miles of Shoreline and is 2 miles wide and about 7 miles long. With its long list of yearly activities, it's no wonder why Hayden is one of the fastest growing counties in Idaho. On the lake are 3 public boat ramps located at Honeysuckle Beach, Sportsman Park and Hayden Lake Marina. In addition to summer water activities the lake also offers camping areas, hiking trails and a beautiful golf course. Hayden Lake offers 2 public campgrounds-Mokins Bay and Sportsman’s Park. In winter months locals and tourists can find themselves in the snow covered mountains on snowmobiles or snow shoes. There are 4 major ski hills within one hour of CDA so your time here rain or shine will be well spent. No matter what your lifestyle hobbies are there is sure to be something that you can find to keep you and your family busy throughout the year. From boating, hiking, camping, fishing, skiing, biking, golfing to just taking a nice walk, you will be sure to love all that Hayden Lake has to offer it's locals and visitors. The Falls in Hayden is one of the areas newest gated waterfront communities in the area. It consists of 56 acres with 46 lots that each come with a boat slip. This area has amazing lake views, picnic pavilions with stone fireplaces to entertain guests year round. Idaho is not known for its waterfalls but you will see a few gorgeous breathtaking falls throughout this development. A portion of the land which consists of 11 acres will remain as is with a hiking trail integrated throughout the park. Hayden Lake Marina is located in Cooper Bay. It's the perfect place to bring your friends and family for a day of boating and fun. The marina has the ONLY on water boat rental for quick and easy boating adventure. With a recent remodel of the Marina it is better than ever. They expanded the docks so there are more available slips to moore your watercraft which has not been the case in past years. It's a great family atmosphere with a easy access family friendly restaurant. On the south side of Hayden Lake you will find the ONLY on the water dining. Not only is this a fun place to stop for food and drinks while your out boating it's a great place to host large or small group events and gatherings. Guests will most likely sit outside on the patio to take in the beautiful views and enjoy the lake atmosphere. The restaurant has an all new food and drink menu sure to have something just for you. The Hayden Lake Country Club is a member owned club with dedication to its members by providing hospitality and first class recreation. The club includes a 18 hole golf course. It also provides a driving and chipping range to take advantage of before you tee off for the day. If golfing isn't your thing the club also offers 6 tennis courts along with a private beach and swimming dock. Full food and drink service is offered throughout the season which runs from mid April to mid October. There are several different membership options to choose from. Honeysuckle Beach provides service to not only boaters with the public boat launch but also swimmers. It's the ONLY public beach and picnic area on the lake. The beach is staffed with lifeguards throughout the summer months. The beach also offers a volleyball court, concession stand, public restrooms and a large fishing dock. For those who don't care for sandy beaches, Honeysuckle has a large grassy area with tall trees that provide shade for the hot summer months. If fishing is your favorite pastime, the sparkling waters of Hayden Lake are where you want to be. With 40 miles of shoreline you are sure to find a spot to reel in some fun! Grab your fishing license, your gear and your ready. Summer or winter, you will find beginner to advanced fishermen trying to catch the big one. Whether fishing from your boat or fishing off a dock you will enjoy the beautiful scenery that surrounds you while you cast away. From croppie to pike there are a variety of different fish this lake has to offer all levels of fishing expertise. Contact Sam about SELLING your Hayden home. Search for Hayden real estate for sale.